Fall is the time of the year when apples are so plentiful. Apple pie, Caramel Apples, Applesauce and, of course, hasselback baked apples. These caramel baked apples are a super delicious way to end a meal and you won’t miss a normal high carb dessert at all! 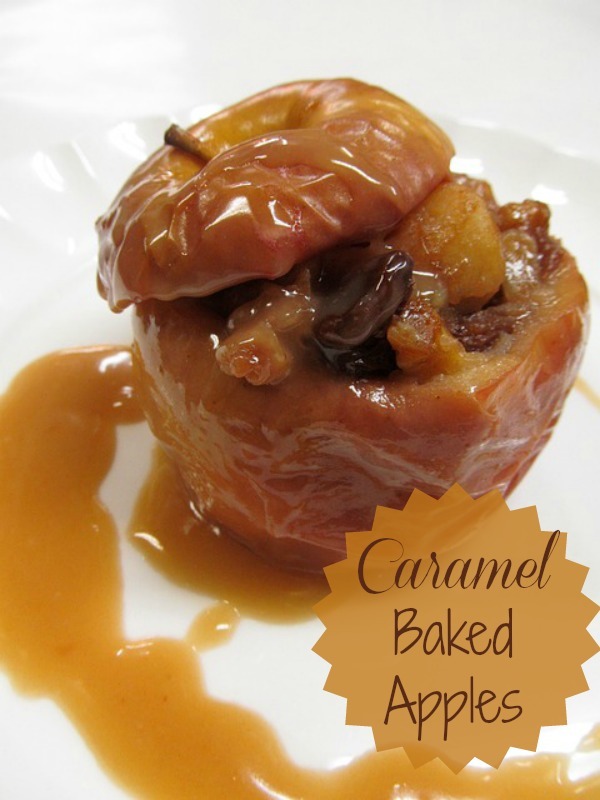 Printable Recipe: Caramel Baked Apples. I love using apples in so many fall recipes. Sometimes, I will make cinnamon baked apple slices. I also have a great home made applesauce recipe. For today’s idea, we are going to bake the whole apple and add a caramel glaze. 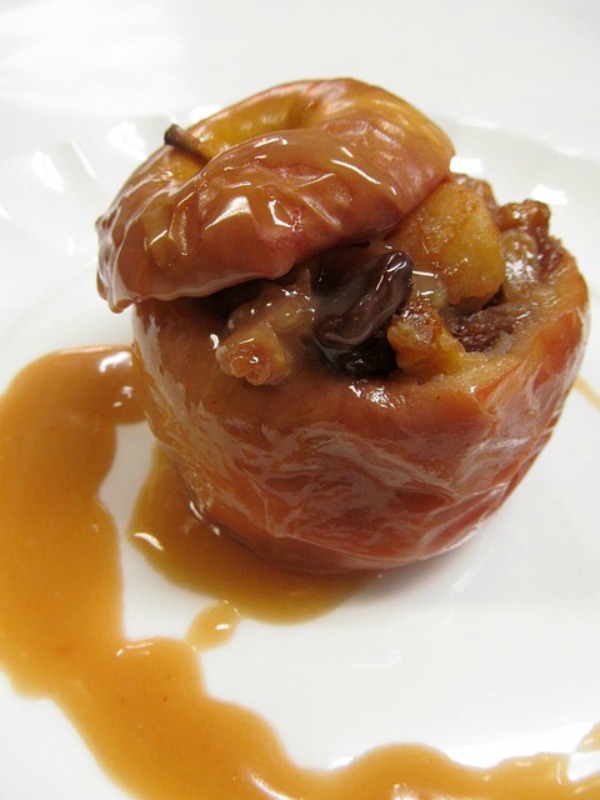 This caramel baked apple recipe is so full of flavor. The maple sugar and cinnamon adds a delightful taste and the brown sugar and butter adds just the right amount of richness to the dish. I used Smuckers caramel sundae syrup to save time, but you could make a homemade sauce if you wish. 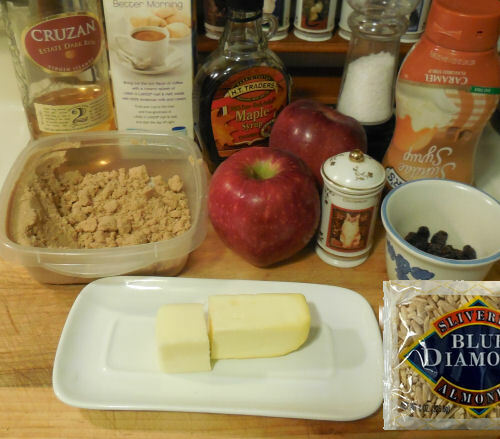 The ingredients are Apples, slivered almonds, butter, raisins, rum, brown sugar, cinnamon, maple syrup, cream, caramel sauce, and rum. Combine the brown sugar, a few raisins, some slivered almonds, butter, maple syrup and salt. Cut off the top of the apples and save it. Core them (I used a melon baller.) Save a bit of the apple flesh to mix in to the mixture too. Spoon the mixture into the cored apples. Place the apple “hat” back on top of the filled apples. 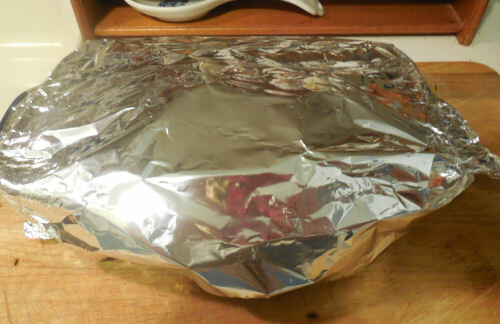 Cover with foil and bake in a 325 ºF oven for 50 minutes until the apples are soft. Just before the apples are done, add the rum to the raisins and heat the caramel Sauce. Add the cream and stir in the raisins.Remove the apples from the oven. Spoon over the Caramel sauce. If you like, you can finish the dish with a scoop of ice cream. Enjoy. Heat oven to 325°. Combine the brown sugar, maple syrup, butter, cinnamon, almonds, raisins, and salt in a bowl and set it aside. Cut a slice from the bottom of apples so that they sit flat; transfer apples to an ovenproof baking pan. Cut off the top of the apple and save it. Core them. Fill hollow cores with the reserved brown sugar–syrup mixture. Cover the apples with foil and bake until tender, about 50 minutes. 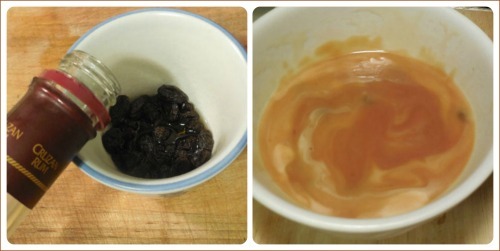 When the apples are almost done, put the raisins into a small bowl, add the rum and let it soak into the raisins. 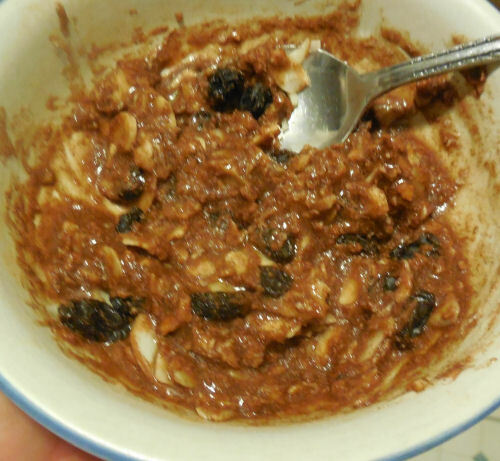 Add the caramel sauce to the rum and raisins and heat the mixture for just a about 15 seconds in the microwave until it gets warm. Remove and let cool slightly. Stir in the cream. Serve immediately over the baked apples with ice cream, if desired.